FLINT, Michigan, February 21, 2016 (ENS) – Work on replacing high-risk lead service lines in Flint is under way as state and city leaders focus on removing pipes in priority areas while analyzing the city’s water pipe network to maximize efficiency, said Michigan Governor Rick Snyder. 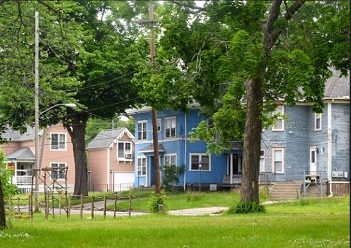 The state last week came to an agreement with Rowe Professional Services, a Flint-based engineering firm, to update recent analysis of water pipes in the city and boost efforts to protect the health and safety of city residents. 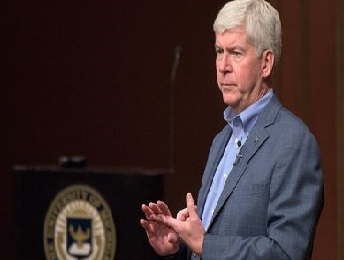 Governor Snyder declared a state of emergency in the city in January, but the water crisis emerged more than a year ago when the city switched water sources in April 2014. Flint changed from water drawn from Lake Huron by the Detroit Water and Sewerage Department to water drawn from the Flint River in April 2014, while the city waited for a new water authority in Genesee County to begin operating later this year. The switch, intended to save money for the city, was done without adding corrosion controls to the water. Old lead pipes corroded as Flint River water flowed through, allowing lead to leach into the city’s tap water. Flint returned to the Detroit water system on October 8, 2015, but the corroded lead pipes continued to allow lead into the city’s drinking water. Exposure to lead is most dangerous for young and unborn children, according to the federal Toxic Substances and Disease Registry, TSDR. Unborn children can be exposed to lead through their mothers. Harmful effects include premature births, smaller babies, decreased mental ability in the infant, learning difficulties, and reduced growth in young children. These effects are more common if the mother or baby was exposed to high levels of lead. Some of these effects may persist beyond childhood. The main target for lead toxicity is the nervous system, both in adults and children. Long-term exposure of adults can result in decreased performance in some tests that measure functions of the nervous system. Exposure to high lead levels can severely damage the brain and kidneys in adults or children and ultimately cause death. In pregnant women, high levels of exposure to lead may cause miscarriage. High level exposure in men can damage the organs responsible for sperm production, according to the TSDR. At least 12 lawsuits have been filed in local, state and federal courts on behalf of Flint residents who drank lead-contaminated water. The complaints name many state and local agencies and officials, from Governor Snyder to Flint city employees. Retired National Guard Brigadier General Michael McDaniel is helping to coordinate the efforts of the city of Flint, the Lansing Board of Water and Light, state and federal agencies and other stakeholders. Snyder said a supplemental budget request approved unanimously in the Legislature last month includes money for utilities and can be used to survey Flint’s underground network of pipes. Ongoing water testing is revealing where there are high-risk, high-priority areas that should be addressed most quickly. Teams are moving with great urgency to locate where lead water pipes are located and focus on high-risk areas. Also included is money for food and nutritional programs, health-related programs and funds to bring relief to residents who had been paying for water they could not use due to its lead content.